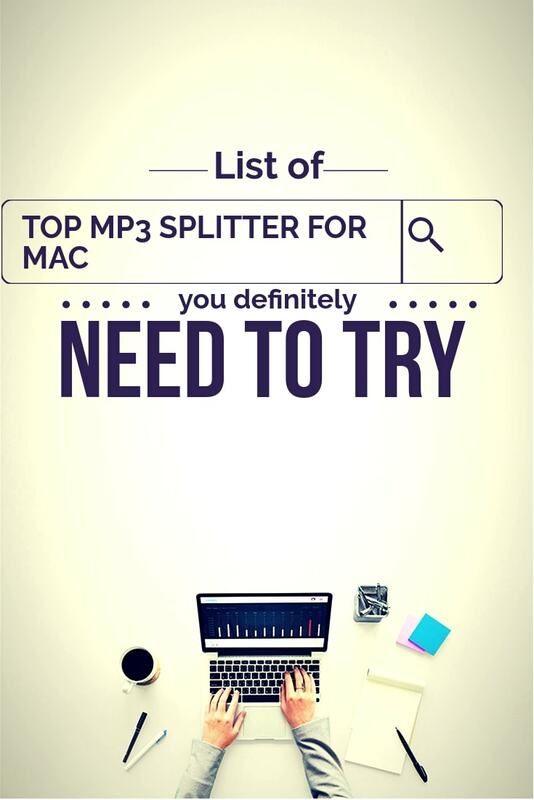 We have prepared the list of top Mp3 splitters for mac users to easily cut, edit and manage the large audio files but we love the design and interface of Apple Macsoft. When you listen to any excellent music track or soulful music, you may want it to be your ringtone or you may want to extract only that appealing part from the music track. Though there are many apps to split large MP3 and other format music files on Android and Windows OS, finding such software on Mac OS device is very difficult. Also, you may also want to edit these music tracks and tune them to use them as ringtone on your mobile. But, finding such software which is compatible with Mac OS is very difficult and it at all such software is found, they will be very professional and often comes with expensive licenses that can be a heavy cost for an average customer. But, the good news is that, with technology many software that helps users to mix, attach or split an MP3 file and remove unwanted sounds, at free of cost for Mac OS as well. In this article, we will discuss such software that helps users to use Mp3 splitter in Mac OS. Apple MacSoft is known for their wide range of products that serve the users of Mac and Apple devices and help them to perform usual operations such video editing, DRM converter, MP3 Cutter etc., Similarly, Apple MacSoft MP3 Splitter for Mac is such software from Apple MacSoft which helps Mac users to split, trim and cut MP3 audio files without losing the Audio quality. Apple MacSoft MP3 Splitter is designed to be easy and interactive so that users will have a great experience using this software along with using it to split large MP3 files. Users can simply drop the desired MP3 directly into the application and the program will instantly split the MP3, M4A or AAC audio files automatically into equal sized parts. This is achieved by feeding information such as split by duration, file size, the number of files required or users can use advanced features such as automatic silence detection to split music files. This MP3 cutter will preview the MP3 file using wave graphics and also set the cut points visually in a manual fashion. The new audio files extracted after splitting are of same quality as that of the original. 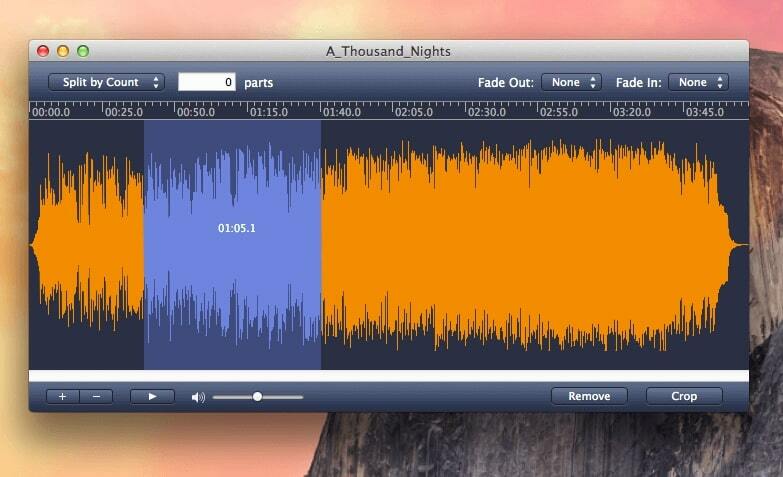 Users can also add effects such as fade-ins/fade-outs to new audio files for perfect playback. This software is useful to split large MP3 files and long audiobook into separate chapters. It also splits MP3 albums, audio tapes, iTunes Music and recorded songs. Apple MacSoft MP3 splitter for Mac has many features that may hit instantly with the users’ requirements. It also provides you with the built-in player which allows you to listen to MP3 audio files. The most important feature of this MP3 cutter is that it gives the ability to split MP3 files based on 4 different modes namely: By count, file size, by Time and by silence detection. Using these modes, users can split their tracks into different subfiles by count of files or setting time or by prescribing file size of each sub-tracks. Also, it has the ability to split music files automatically based on the silence detection. This software makes use of multi-threading processing and thus you can even split large audio files of size in GB in very high speed using the batch processing operation. This MP3 splitter gives users to visually split the audio files using audio form. They can also visually define the time to split using the sliding bar. It enables users to remove unwanted sounds from the soundtracks easily with one click. It has fast engine that splits large MP3, M4A and AAC files into small audio files without loss in the quality of the original. Another great feature of this software is that it helps users to split Audiobooks into separate chapters automatically which make users listen to their chapters separately instead of accessing the full audiobook. As mentioned, it supports audio files of format, MP3, M4A and AAC. It acts as easy CUE splitter and cuts any parts from audio files without recompression. It also has an inbuilt silence detector, which makes it easy for this MP3 cutter to split particular audio files into several parts based on silence automatically. With this software, users can split large MP3 files into favourite parts and make their own ringtones using crop and fade features. Also, you can add fade in or fade out options to the music files. It preserves the original quality of audio files and supports the changing the scale of the timeline. 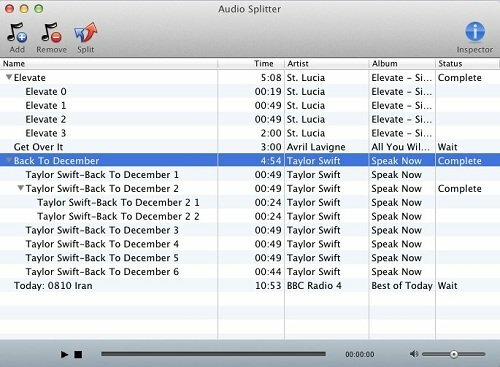 MP3splt for Mac is one best MP3 Splitter available in the market for Mac OS. It is open source software that helps users to split MP3 files and OggVorbis audio files. It allows users to split large MP3 files into small files or divide a full album into individual tracks. It is very easy to use and all you need to do is to select a start and the end position for cutting the audio file. Important feature of this MP3splt is that it doesn’t decode the file during the splitting which avoids any loss because of digital degeneration. You can split an entire album into separate tracks, either by giving the input of split files and file names manually or you can get them through CDDB or .CUE files. This MP3 cutter also supports automatic silence split which can be used to adjust the split points. Another great MP3 splitter for Mac users is Macsome Audio Splitter freeware. With this software, you can split large MP3 files or AAC files into smaller files in a couple of seconds. It preserves the tags and quality of sound while splitting them. Another unique feature of this software is that it allows batch splitting which allows users to split a bundle of audio files at the same time. With Macsome MP3 cutter, you can split audio files either by selecting time or number of files required from the original. Also, you can split by choosing the start and end time to split. It provides a playback feature that allows users to play the audio file and adjust the volume. It can run on Mac OS with at least 512 MB of RAM. With the increase in technology, there are software development companies coming with various applications for Mac OS users. But it is important to choose best among the lot to get the best quality of output and complete the task easily. Hence, if you are a Mac User and want to have a quick splitting process and remove unwanted sounds from music files, choosing one among above software will help according to your requirements.